I don’t know about you but the last thing I want to do when I get home from work is spend hours cooking dinner. That being said I’m not about to sacrifice taste or make something unhealthy just because it’s easy. When I came across the recipe for Penne with Chickpeas and Rosemary in Scott Conant’s New Italian Cooking cookbook….I knew I had a winner. Just a few healthy ingredients; cooked up in minutes…this pasta is perfect for a weeknight meal. Heat olive oil in a saute pan. Add rosemary and heat until fragrant. Add the chickpeas with their liquid, the chopped tomatoes, chicken broth and crushed pepper. Cook until the chickpeas are heated through. Puree half of the pan's contents in a food processor and return puree to pan. Season with salt. Meanwhile, cook pasta in boiling salted water until about 3/4 of the way cooked. Reserve approximately 1 cup of the pasta cooking liquid. 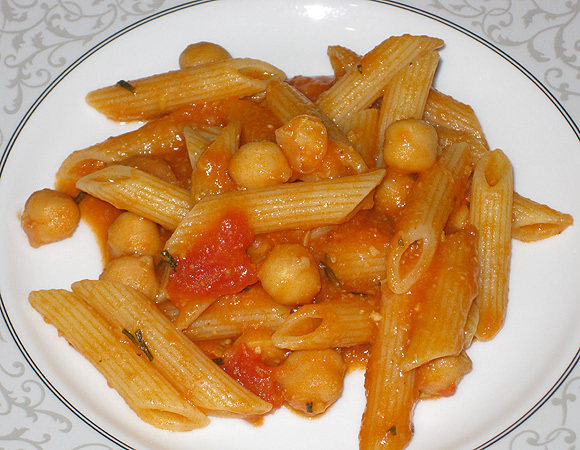 Toss the drained pasta with the chickpeas. Turn the heat up to medium-high and cook tossing until the pasta is well coated and cooked to al dente. Add reserved pasta liquid to thin the sauce if necessary. Serve pasta with grated Parmigiano-Reggiano. This is getting bookmarked. When I see a recipe that I wish I had in front of me as we speak, I know it is a winner! I am the same as you - I love quick and easy meals for dinner. thanks for sharing. I've never thought of using rosemary with chickpeas before, but I imagine I would like it quite a bit. Thank you for sharing with me, my friend. I'm on the way to Maine, and visiting your blog is making my plane flight a lot more enjoyable. Hugs! Happily just subscribed to Foodhunter's Guide! Keep those awesome chocolate recipes coming! That for sure is a winner:-) quick n easy dinner!! I had not considered putting chickpeas in a pasta dish. Now, I'll consider it! :) Great post! The pasta looks delicious. Love those quick meals. I'm glad you are making sure you have something healthy and tasty at night. Isn't it amazing how wonderful it can make your day to know you're going to have a good dinner at the end of the night? Yum I love simple pasta dishes like this!! Chickpeas are so good. Simple but so delicious! I love that it's mostly pantry ingredients - all of which I have - I am SO making this for dinner one night soon. I've never thought to add chickpeas but what a great idea!! Looks so fab! Yum - looks delicious. I love anything with chickpeas in it so I will try this one for sure. This is one of the reasons I love Italian cooking = it doesn't take much effort to turn out a delicious meal, provided you have good ingredients. I love simple and delicious meals like this!